CYCLOIDAL GEARBOXES grinding of cycloidal discs and ring gear housings Cycloidal gearboxes allow for very high transmission ratios, have small space requirements, and are characterised by very high torque, high stiffness and resistance to wear. Cycloidal gearboxes are typically used in drives for industrial robots. In cycloidal gearboxes two or more proﬁled cycloidal discs roll off in excentrical motion with ring gear pins inside a ring gear housing. The distance of the ring gear pins equals the pitch of the cycloidal discs. Since the ring gear housing has one pitch more than the cycloidal disc, the cycloidal disc advances one pin further with each complete rotation. 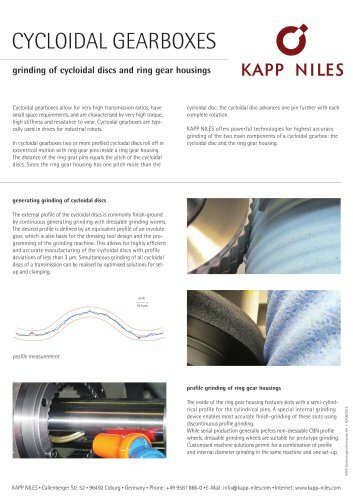 KAPP NILES offers powerful technologies for highest accuracy grinding of the two main components of a cycloidal gearbox: the cycloidal disc and the ring gear housing. generating grinding of cycloidal discs The external proﬁle of the cycloidal discs is commonly ﬁnish-ground by continuous generating grinding with dressable grinding worms. The desired proﬁle is deﬁned by an equivalent proﬁle of an involute gear, which is also basis for the dressing tool design and the programming of the grinding machine. This allows for highly efﬁcient and accurate manufacturing of the cycloidal discs with profile deviations of less than 3 µm. Simultaneous grinding of all cycloidal discs of a transmission can be realised by optimised solutions for setup and clamping. proﬁle measurement KAPP NILES • Callenberger Str. 52 • 96450 Coburg • Germany • Phone: +49 9561 866-0 • E-Mail: info@kapp-niles.com • Internet: www.kapp-niles.com The inside of the ring gear housing features slots with a semi-cylindrical profile for the cylindrical pins. A special internal grinding device enables most accurate ﬁnish-grinding of these slots using discontinuous proﬁle grinding. While serial production generally prefers non-dressable CBN proﬁle wheels, dressable grinding wheels are suitable for prototype grinding. Customised machine solutions permit for a combination of proﬁle and internal diameter grinding in the same machine and one set-up.